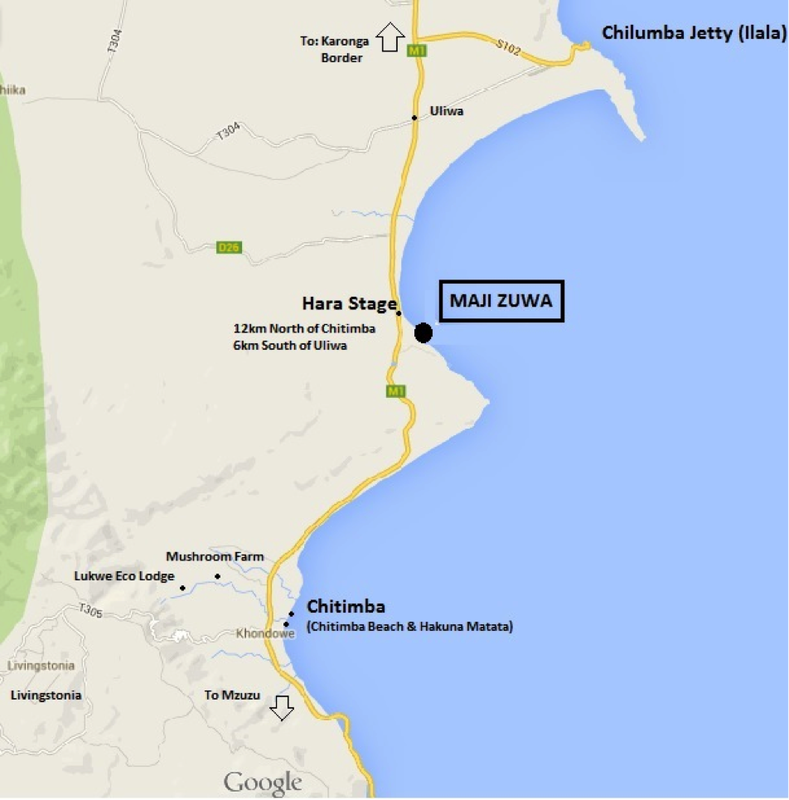 Maji Zuwa is located in the northern most section of the country in the Chilumba area of the Southern part of Karonga District, right next to Chitimba. Many people like our lodge as an alternative jumping off point to Livingstonia - Mushroom Farm - Lukwe Eco Lodge, if they want something different than what is provided at Chitimba. It's easy to do, you can leave your big bags and we're only 5 minutes down the road. Our turnoff is at Hara Trading Centre (Hara Stage on Public Transport). We are 500 meters from the road; very walk-able. We have tried to offer you the most realistic price for transport (updated June 01, 2018), but, as always, prices do change. And most of the time it’s not worth haggling over K100. From the border, take a minibus or taxi to Karonga town first (K2,000; one hour) and from Karonga jump on another minibus to Hara Trading Centre (K2,000 - K2,500; one and a half hours). You can easily make it from Mbeya to Maji Zuwa with time to spare in one day. If you’re traveling by boat, we are across the bay from Chilumba port. You can take a taxi from the boat (around K7,000) to Maji Zuwa or we can pick you up ourselves at a cost of K15,000 (unlimited number of people). If you get in during the day, you can take public transport to Uliwa (port to Uliwa K400; 10 minutes) and join with a transport from Uliwa to Hara (Maji Zuwa) (K400; 5 minutes).